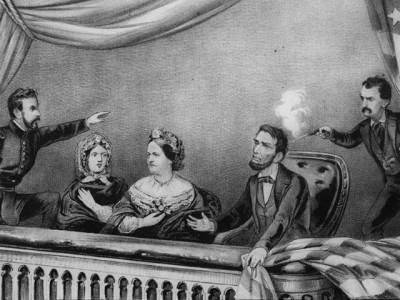 It was 154 years ago when President Abraham Lincoln was shot while watching a play at Ford’s Theater. Lincoln died the next morning, and in the aftermath, some odd facts seemed to pop up. Why wasn’t General Ulysses S. Grant in the theater box with Lincoln, as scheduled? Where was the President’s bodyguard? How many people were targeted in the plot? And how did all the assassins escape, at least temporarily? Many of the questions were eventually answered, but some still linger today. And some people have doubts about one of the alleged plotters and her involvement in Lincoln’s murder. 1. Where was General Grant? He wanted to be in New Jersey! Grant was advertised to be at the event, according to the New York Times, but he declined the invitation so he could travel with his wife to New Jersey to visit relatives. In that first report of the assassination from the Times, the newspaper said Lincoln was reluctant to go to the play. However, since General Grant canceled, he felt obliged to attend, even though his wife didn’t feel well. Lincoln tried to get House Speaker Schuyler Colfax to go with him, but Colfax declined. “He went with apparent reluctance and urged Mr. Colfax to go with him, but that gentleman had made other engagements,” the Times reported. 3. If Colfax had been in the booth with Lincoln, two persons in line to succeed Lincoln would have been in danger. Vice President Andrew Johnson was also an assassination target, but his assailant lost his nerve and didn’t attack. Colfax was third in line to succeed Lincoln, after Johnson, and Senate Pro Tempore Lafayette Sabine Foster. Secretary of State William Seward wasn’t in the line of succession in 1865. 4. Why wasn’t Vice President Johnson attacked? John Wilkes Booth had convinced George Atzerodt, an acquaintance, to kill Johnson by setting a trap at the Kirkwood House hotel where the Vice President lived. However, Atzerodt lost his nerve and didn’t attempt to kill Johnson, even though he had a rented room above Johnson’s, and a loaded gun was found in the room. 5. How did Secretary of State Seward survive despite having his throat stabbed two or three times? Assassin Lewis Powell gained entry to Seward’s home, where the secretary was bedridden after a carriage accident. Frederick W. Seward, his son, was seriously injured defending his father during Powell’s assassination attempt. The secretary was wounded, but the metal surgical collar he was wearing protected him. 6. Where was Lincoln’s bodyguard? The Smithsonian Magazine did a story on this a few years ago. John Parker, the bodyguard, initially left his position to watch the play, and then he went to the saloon next door for intermission. It was the same saloon where Booth was drinking. No one knows where Parker was during the assassination, but he wasn’t at his position at the door to the booth. 7. Where was the Secret Service? It didn’t exist yet, but Lincoln signed the bill creating it that night before he left for Ford’s Theater. 8. How did Booth stay in hiding for so long? Booth was able to escape Ford’s Theater alive, and he was on the run for 12 days, accompanied by another conspirator, David Herold. The pair went to the Surratt Tavern in Maryland, gathered supplies, went to see Dr. Mudd to have Booth’s broken leg set, and then headed through forest lands and swamps to Virginia. They were also aided by a former Confederate spy operative and by other Confederate sympathizers. Military forces were hot on their trail, and they found a person who directed them to a Virginia farm. At the Garrett Farm, Booth was fatally wounded, and Herold surrendered. Booth met with his conspirators in March 1865 and came up with a plan to kidnap Lincoln as he returned from a play at the Campbell Hospital on March 17. But Lincoln changed his plans at the last minute and went to a military ceremony. Booth then thought about kidnapping Lincoln after he left an event at Ford’s Theater. But the actor changed his mind after Lee's surrender. 10. Was Mary Surratt part of the conspiracy? That’s a topic still being debated today. Surratt was a Southern sympathizer who had owned land with her late husband in Maryland. She also owned a home in Washington that was also used as a boarding house, and she was friends with Booth. She also rented a tavern she owned in Maryland to an innkeeper. Surratt was with Booth on the day of the assassination, and she allegedly had told the innkeeper to get a pair of guns ready that night for visitors. The innkeeper’s testimony doomed Surratt to the gallows. What was controversial was the decision to hang Surratt – a decision personally approved by President Andrew Johnson.